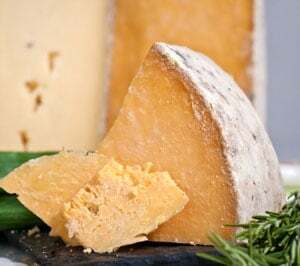 Handcrafted by world champion cheesemaker Michael Spycher at the Swiss mountain dairy Fritzenhaus, which has been making fine artisan cheeses since 1847, Hornbacher is made from nutrient-rich milk sourced from 12 local farmers who deliver fresh milk to the dairy twice a day. Their cows graze the entire summer on lush meadows and eat fine hay during the winter months, guaranteeing the highest quality milk and allowing a long, natural 12-month ripening process. The dairy resides in a small, secluded mountain hamlet in the community of Sumiswald, located in Switzerland’s legendary and picturesque Emmental valley region. 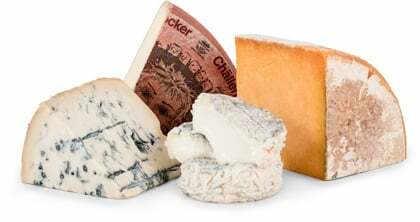 The cheese itself takes its name from the Hornbach river which runs alongside the dairy. Michael has strong relationships with his farmers—so strong, in fact, that in 2013 they helped him build his new cheese cellar where he ripens and cares for the Hornbacher cheese that you’ll have the opportunity to try this month. In addition to crafting his world champion Le Gruyère AOP, Michael has produced his specialty, Hornbacher, for almost 25 years. Prior to 2014, he and his wife Monika sold Hornbacher only at their local market and the tiny cheese store at the dairy. We’re so excited that we can now get our hands on enough of this small-batch artisanal treat to be able to share it with you. Hornbacher arrives in warm burnished brown colored 12-pound wheels that when first opened offer hints of mushrooms, mineral notes and browned butter. Think roasted hazelnuts and caramelized onions. The cheese maker describes the flavor as 'buttered baked potatoes.' This firm cheese is a bit crumbly, presents flavor crystals, and stands out for its intense savory umami flavors and creamy mouthfeel. It will pair nicely with fortified dessert wines like sherry and port, or a big malty beer like Elevation Beer Company’s Cabernet Sauvignon barrel aged quadruple, Apis IV, featured in The Rare Beer Club. It will also pair well with bolder-flavored white wines like an Alsatian Pinot Gris. The dairy suggests using it in your favorite Cordon Bleu recipe.